Love is always in the air, right? Or at least it should be. And while we do appreciate the idea of a Valentine’s getaway, nothing should stop you from taking off with your significant other to romantic places across the country, any time of the year. Whether you’re beach bums or prefer the cold mountain breeze, make it more cosy and up the intimacy by checking into charming Airbnbs. From cabins in woods to suites in havelis, bring on the romance! Like a cottage straight out of a fairytale, this little chateau is nestled in the hills of Kodaikanal. With cobbles-stone pathways, a little pond out in the garden, exposed brick walls, it’s really like a dream. Add in a fireplace, warm wooden furniture to add to the cosiness and crisp mountain air, and you’ve got yourself a movie set for romance. Nothing like a grand haveli to set the mood for love, eh? And when it’s a lovely one, standing tall since the 18th century, then more so. Pick from Bairisal Mahal and Sultan Mahal, two of the suites, which features four-poster beds, intricate wall art, medieval artefacts, and a separate drawing room, in regal style. There’s also three courtyards in the manor, perfect to settle into when the sunsets and reminisce about the past, or plan the future together. Set in one of the oldest tea plantations in Darjeeling, the Jing Tea House is a colonial style bungalow which will take you and your love back in time. With rooms facing the gorgeous mountains, a lovely garden with gazebos to cuddle under and of course lavish bedrooms and drawing rooms to lounge in, we love this place. Plus, it’s Darjeeling. So nothing like the cold air to bring you closer! Oh so cheery, That Little Orange Place is all kinds of cute. While it gives very homely vibes, what we love is the quirky way in which it’s done up. Modern paintings, a charming balcony, a little spot in the bedroom to get cosy and chat, plus a bedroom just like you’d want to live in. Breakfast is part of the deal, but how it’s served is adorable – on a tray that says Have A Nice Day! A rather premium homestay, this one’s done up in white, blue and wood. Overlooking the Kanan Devan hills, while we do love the bedroom, we’re picking this one for the balcony. Be it sunrise or sunset, it’s perfect to just settle into the deck chairs with tea or a glass of wine and just enjoy the serenity and each other’s company. Oh! There’s also a brick oven, so if you’re into baking, we suspect it could be a rather romantic experience! The home of an designer and architect, it’s no wonder that this place is picture-perfect. Exposed brick walls, wooden accents and rafters, this one features curated paintings, Buddha images, vintage ceiling fans, modern furniture and a book case to swoon over. And the bedrooms are so artistic, it’s like living in an indi film! We might check in here ourselves – significant other or not! At best of times, the Ketti Valley, near Ooty oozes romance. 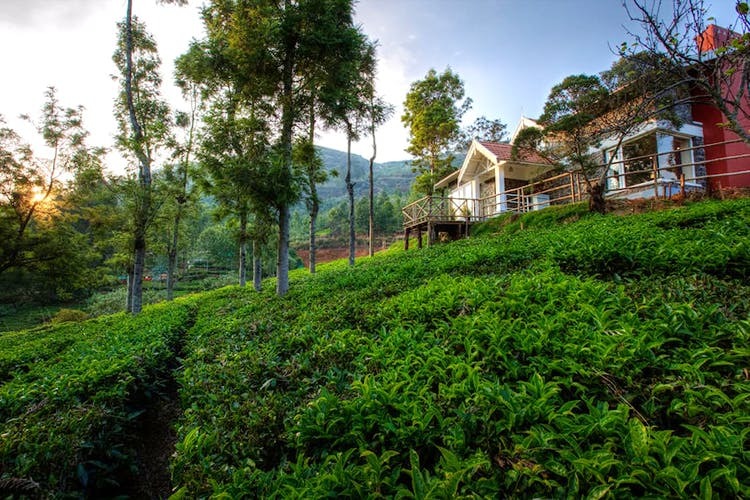 But when you add in a secluded cottage, full with a wooden balcony on stilts, over the tea gardens, and you’ve got yourself the perfect spot. Raftered ceilings, bay windows, a fireplace and a cobbled path will welcome you here, and you get to pick from two little cottages. Maybe make it a double date? Star gazing should also be top priority at night. Don’t say we didn’t tell you! Surrounded by trees for miles, Redburn Lodge is a bit like the cottage Snow White and the seven dwarfs lived in! Since it’s up in the hills, the view is spellbinding. But even without that we’d stay here, any day. Quaint and unpretentious, our top spot in this lodge is the diwaan beside the baywindows – perfect for a cuddle. Rooms are also homely, so don’t expect star-hotel chic. An old-school colonial bungalow, you’ll just never want to leave the estate campus once you check in here. Splurge on the Blackwood suite, we say. It’s worth it for the four-poster bed, a parlour area, powder room and a bathroom as large as most city-apartments! Want to live in a luxury, heritage home in the French Quarters of Pondicherry? Check into room 6, at the house named Gratitude. In typical French style, the bedrooms are small with four-poster beds. But it’s the wrap-around balcony that we’re in love with. Especially since it overlooks a courtyard with old trees. Imagine waking up to that, that too with you SO right beside you. Bliss. If you’re new to Airbnb, sign up here and get a discount of INR 1,000 on your first stay! This story is in partnership with Airbnb.